Astech Environmental Services Limited, Dorset, have been providing asbestos surveying and asbestos removal services to Dorset, Hampshire, Wiltshire, Somerset and Devon for over 25 years. 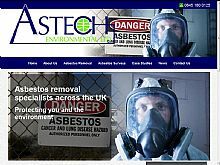 Astech have a large local client base using them for professional asbestos removal in Bournemouth, Poole, Dorchester, Salisbury & Yeovil. Using the latest equipment, Astech help home owners and commercial customers with asbestos removal and disposal. Astech are a licensed asbestos removal company, they are members A.C.A.D (Asbestos Control and Abatement Division) and T.I.C.A. (Thermal Insulation Contractors Association) so customers can be reassured that they are using a highly qualified firm that follow the most current regulations. If you are looking for asbestos removal contractors in Dorset, Hampshire, Wiltshire, Somerset or Devon, contact Astech Environmental Services Limited for asbestos surveying, safe encapsulation, asbestos removal and asbestos disposal services. Astech Enviromental Services also provide testimonials and case study information to show how they are experts in this field and put customer service at the forefront of their business.